This is a play on a technique I picked up in an amateur cooking class. We submerged cherry tomatoes in olive oil and poached them for a while. I never did this back at home since olive is kind of expensive and I didn't have use for it after I am done poaching. So I froze a few spoonfulls of oil and dropped it into the bag and SV'ed at 85c for 40 minutes. They come out looking raw but are fully cooked, nice surprise in a salad. ... I use a Le Creuset ribbed grill pan, and put it on the stove at a medium high heat without any oil or butter (and certainly no Pam). I'm sure a well-seasoned lodge pan would work equally well, but the Le Creuset is easy to clean, and didn't require seasoning. In comparison to using smoking hot oil, the torch method seems to sear the little bumps on the surface of the meat, more than searing everything, but maybe I don't sear it long enough. The searing is mostly for looks, and a bit for the maillard reaction, but I don't want too much crust, and I don't want to overcook the meat. I think that the flavor and mouth-feel will be best if you go for crust development rather than grill marks. A nice crust contributes a lot to the flavor -- grill marks not so much unless they are scorch marks. If you put it into a medium-hot pan and flame the side that is face up -- I think that you will end up cooking the steak a bit more than you would if you either used a super hot pan for 30 seconds a side or if you use the torch but have the pan at a warm temp rather than hot temp. Because torch searing takes longer than searing in a really hot pan. 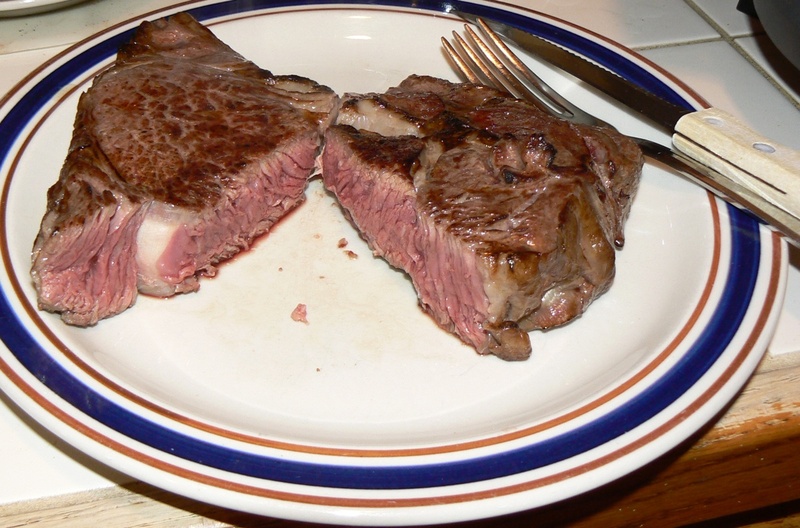 The reason for having the pan warm (but not hotter than the steak -- is that if you put the steak on a room temperature piece of metal -- it will quickly rob heat from the steak. I, too, have just started working with the Iwatani (which can be had for under $30) to do the searing/crust for steaks. It clearly is going to take me some practice to get it so that it rivals what I can do with a pan -- but getting it right in a pan took a lot of practice too. It may be that using a super hot pan will be the best method but I want to work with the torch more before deciding since cleanup is a lot less of a hassle when using the torch. 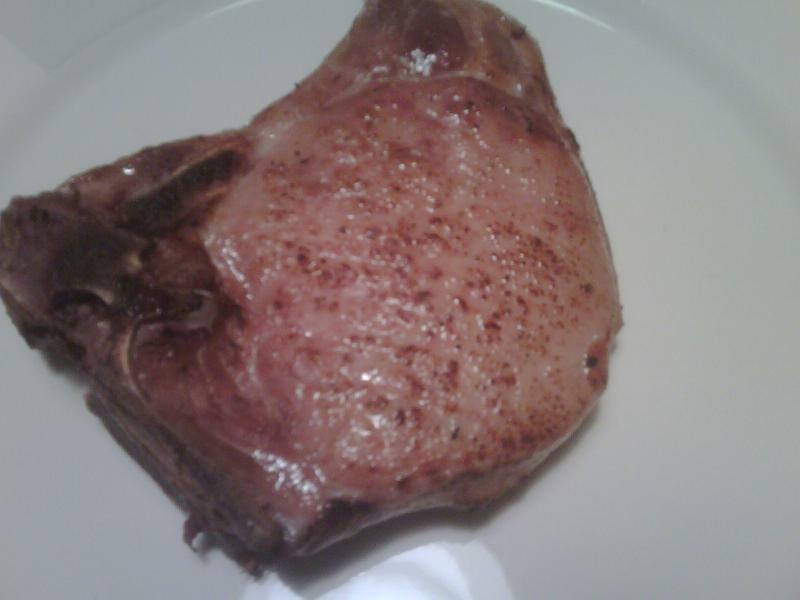 I had a very disappointing center cut pork chop last night. Though I had planned to originally cook it for a couple of hours at 137, I ended up doing 137 for those 2 hours or so, and then dropping it down to 135 for about 20 hours more. Very dry. I did not brine before cooking, but was still quite surprised at the dryness at only 137 degrees. I'm going to do one brined, one unbrined next time, but at 134 for only a few hours. I recently got Keller's Under Pressure and the biggest eye opener was that you can overcook meat SV. "Pink, but overdone" is how he put it. As I read it, I realized I had done this to a beef filet. I had wondered why it wasn't as good as I thought it was going to be. But at the extreme of this is lobster. Although I never thought it would be something you'd cook for a long time, Keller says a tail will be done in 15 minutes and then there's a 10 minute window to get it out. While that's a leisurely pace as lobster cooking goes, in usual SV terms it seems like a drag race. At what temperature did you cook your beef filet? I do not have the book of Thomas Keller, but I suspect that his recommended temperatures are much too high for legal reasons. I can't remember for sure, but it would have been between 131 and 135F. But for four-five hours. In the cookbook forum I posted a similar sentiment about his (140F) temps and the possibilities of lawyerly intervention. In retrospect, unlike pork ribs or say, beef short ribs, I can't see that there's anything to be gained by longer SV periods when it comes to filet. And I wouldn't at all be surprised to learn (definitively) that there is much to be lost. With tender cuts of meat, you really don't want to overdo the cooking. You will see this warning over and over in this thread. For some reason, people have the notion that longer is better -- but that is really only for cuts of meat where you need tenderizing. For a tender cut (filet, ribeye, etc. anything over a few hours will start to have an adverse effect. At four hours, it won't be bad but it won't be as lovely as it would have been if it had only been cooked for a half hour or an hour. With filet, I wouldn't leave it for more than an hour (at temps under 133F). When experimenting with getting 'perfect tri-tip', I turned one into a a really unappetizing chunk of flesh by cooking it to long (at 133F). I went something like 36 hours and it looked beautiful but in the mouth it was soft almost to the point of being mushy. To my taste 7 to 10 hours is all a decent tritip needs. So, when deciding on cooking time, it pays to think about the purpose of the cooking. With tender cuts, the goal is to just bring it to temperature. As cuts get tougher, there is also a goal of tenderizing the meat at the same time that you are keeping it at your ideal doneness. And how long that process needs to be will depend on the cut. Tritip is a little tough on its own and so needs more time than tender cuts but nowhere near as much time as tough cuts like chuck, short ribs and brisket. Lamb is also prone to overcooking and turning somewhat soggy. At least, that's true of the New Zealand lamb that I have access to. So, when SVing lamb I avoid letting it stay too long. That may not be true of mutton, but mutton isn't sold hereabouts, so I cannot say for sure. First, chicken legs are, in the poultry world, a "braising cut." While one would normally want a chicken breast "just barely cooked through," a chicken leg cooked this way would not be appetizing and would probably be a bit chewy. This is why chicken legs are traditionally braised or baked or otherwise cooked until they're hammered through. Indeed, you can braise a chicken leg for an hour and it's still pretty good, and a chicken leg cooked confit-style might be at a light simmer for many hours. Second, your temperature is quite low for chicken leg meat. It's only a few degrees higher than the usual temperature for breast meat. So it seems likely that the "tough" quality of leg meat combined with your lower-than-usual temperature combined to give you a good result. This is not the same thing as leaving in a tender cut, such as pork loin or fillet mignon, for a long period of cooking. Congratulations Pedro et al on the PID guide - looks like an interesting read. I am planning on buying the higher accuracy 1500D soon. I have a question that you may be able to answer - in the meantime I use a commercial pid controller to control the temperature of my large pot sitting on a hotplate. I've noticed that once my pan has come to temperature and I add my protein (steak, fish etc.) that the temperature will often jump up a good few celsius more than the set temperature, vacillate around a little, and become stable at the right temperature after some time. Is this a common situation with this type of controller? Do the Auber Instruments controllers do this? Is there any way I can avoid the temperatures spike after I put the food into the pot? Temperature overshoot indicates that the PID tuning could likely be improved. Minimising overshoot (and ringing) is what the PID is really about. The PID's control problem becomes more difficult, the greater the time lag between a heat input change and its effect being detected by the probe. Anything you can do to to shorten that delay will make the task easier for your PID (with suitable tuning) to do better. Improved water circulation from heater to probe (and retuning in that configuration), should help your PID to reduce the overshoot and ringing. This is exactly the behaviour that the PID controller allows you to tune for your specific environment. Increasing the P value will help reduce overshoot by slowing the heating more as the set temperature is approached. This is often enough, but in some cases it can slow the response time down too much. In general the better insulated the pot is the slower it recovers from overshoot. It is increasingly difficult to stabilise a pot the better the insulation is. In a completely uninsulated pot (like a stock pot with an immersion circulator) tuning the PID is fairly simple as any overshoot is neutralised fairly quickly by the normal heat loss. Increasing the I value can also help to reduce overshoot. In general it is better to start experimenting with a high I value and to slowly reduce it until oscillation is detected - then increase to the point of stability. While there are differences in the way PID controllers are implemented, the general theories apply. The Auber 1500 A/B/C models will behave in the same way as the FMS models, but as far as I am aware the 1500D is unique to FMS. The temperature spike after adding cold food to the tank can be explained by a too small D value. Assuming that you have achieved stability using P and I, for normal ramp up and hold operation if you get overshoot after adding cold food try increasing the D value to make it's action weaker. All this is explained in our guide. 1) Different cuts of meat even from the same animal can have very different characteristics and so the appropriate temperature/time and "forgiveness" vary. 2) Different kinds of meat can be structurally and chemically quite different and so the appropriate temperature/time and "forgiveness" vary. What works for chicken thighs may or may not work for chicken breast and almost certainly won't apply to something very different like short ribs (on one extreme) or file (at another). 3) You need to know what the cooking is intended to accomplish. The temperature/time combination to achieve a particular goal will be different from cut to cut and from type of meat to type of meat. If the goal is to bring meat up to temp -- you need to know how long it can be at temp before it starts to undergo undesired structural changes. The time is different even among tender cuts -- ribeyes can generally stand more time in the bath (though not necessarily benefitting from it) than filets. Some combinations of cut/meat/cooking goal are very forgiving and some aren't. For example, there isn't a huge different in result when cooking a decent quality tri-tip at 133F for eight hours or twelve hours. But a four hour difference in cooking time for some cut/temperatures (like a filet at 133) would make a big difference. Eggs are a perfect example. If you cook an egg at 160F, a difference of just a minute or two is the difference between a perfect yolk and one that has started to set too much. If that was too obvious and simplistic, I apologize. Doug Baldwin's guide covers these issues very well. Since no one has replied to this. I am not sure if the dryness was due to cooking time or your actual chop or how compressed the bag was or how the chop was treated after coming out of the bath. 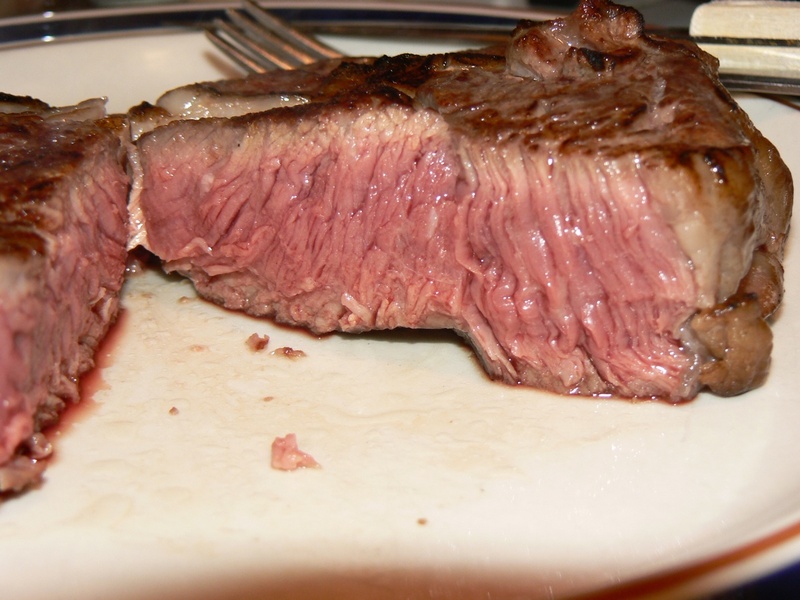 Keep in mind that a piece of meat that is not juicy to begin with won't become juicy via sous-vide cooking. Brining helps enormously with pork and chicken. Even a little bit of a really light brine (let's say 3% to 5%) in the bag can help. Also, over-compression of the bag (as documented elsewhere in this topic) can cause a dry mouth-feel even if the meat isn't technically dry. How did you brown the chop? The method of browning could also influence. Typically being in the bath too long will cause texture issues (like overly soft meat or meat falling apart) rather than dryness per se. At least, that is my experience. I don't have a high-powered vacuum -- just a frisper -- so I doubt overcompression was the main problem. I didn't mean to imply that I believe the length of time was the principle culprit. After this experience, my guess is that 137 is just too high for a pork chop unless you're pulling the meat out of the bath before it even reaches that internal temperature. There was no pink hue whatsoever to this chop, and I don't think it was because of the browning. I used my iwatani torch, and as you can see from the photos, I didn't overdo it with the color. As I said, I'll definitely give brining a shot next time in addition to dropping the temperature of the bath. Try putting the protein in right from the start. This is a tricky issue, and to some extent depends on your preferred style of cooking. If you are cooking a thick steak that may take half an hour or more to come up to temperature, a little overshoot won't hurt, and it might actually help bring the meat up to the final temperature more quickly. On the other hand, if you are cooking something delicate, like fish or lobster, or even an egg, you may not want even the slightest overshoot -- even it it takes considerably longer to stabilize. For this reason, there isn't any single "right" answer, and the PID controller can't read your mind. but a little trial and error should allow you to settle in on a preferred set of values fairly quickly. Out of curiosity, how did you calibrate your rig? Out of some fourteen digital thermometers I own, I have seen variations of several degrees, even with those that were "certified" to be within 1/2 degree F. In disgust, I bought a NIST-calibrated reference thermometer that cost more than all the rest of my SV equipment put together, but at least I now have confidence in my temperature read-outs. An analog, non-mercury basal or ovulation thermometer would be my recommendation for an inexpensive calibration tool, although it is best suited for cooking salmon mi cuit, at about armpit temperature. After this experience, my guess is that 137 is just too high for a pork chop unless you're pulling the meat out of the bath before it even reaches that internal temperature. There was no pink hue whatsoever to this chop, and I don't think it was because of the browning. I used my iwatani torch, and as you can see from the photos, I didn't overdo it with the color. I don't think that cooking at 137F would have caused it to be dry. If there was no pink at all, I would wonder if your bath actually ended up being above 137F for enough time to cook the chop at a higher temperature. At 137F, there should be some pink. 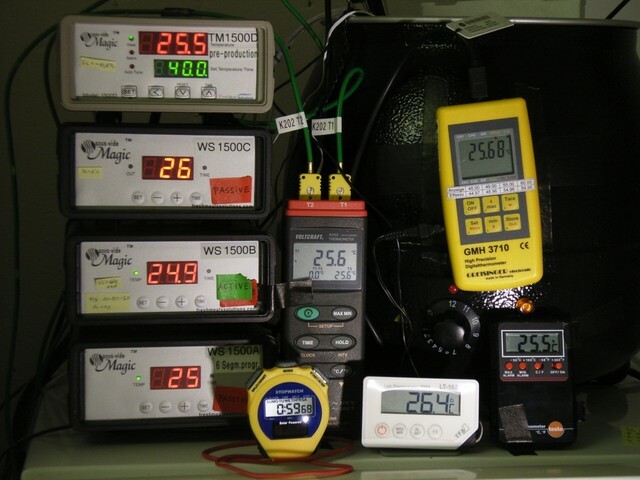 1) Your PID's temperature offset may need calibration. If you haven't calibrated it, do so. It is not unusual for the calibration to be off by a few degrees which is easily fixed. The easiest way to check it is by setting the PID to 100F and then using a digital thermometer made for checking to see if you have a fever and seeing what temperature it reads. Those thermometers are very accurate through a tiny range (something like +- .2F in the range of about 96F to about 108F) and they are usually pretty inexpensive. They are useful for calibrating the PID IF the PID is off by a constant amount through the range in which you will be using it -- and at least with the Auber units I have found that to be the case. If it doesn't read within a half degree of 100 you will want to enter an offset on the PID. My first unit was off by 2 degrees. Since the meat wasn't pink at all, it is likely that the meat spent time about 140F. It has been a while since I cooked pork at 140F but I seem to recall that even at 140 it is at least a little bit pink. (Perhaps my recollection is wrong). 2) Your PID's setup being such that there is temperature cycling going on that you didn't notice. Since it ran for 20 some odd hours, it is possible that the temperature went to 140 or above when you weren't looking and overcooked the meat. There are other explanations but those seem the most likely to me. In my experience, pork needs lower temperatures (52°C/126°F) than beef filet (54-55°C/129-131°F), and especially lean pork is prone to feel dry. 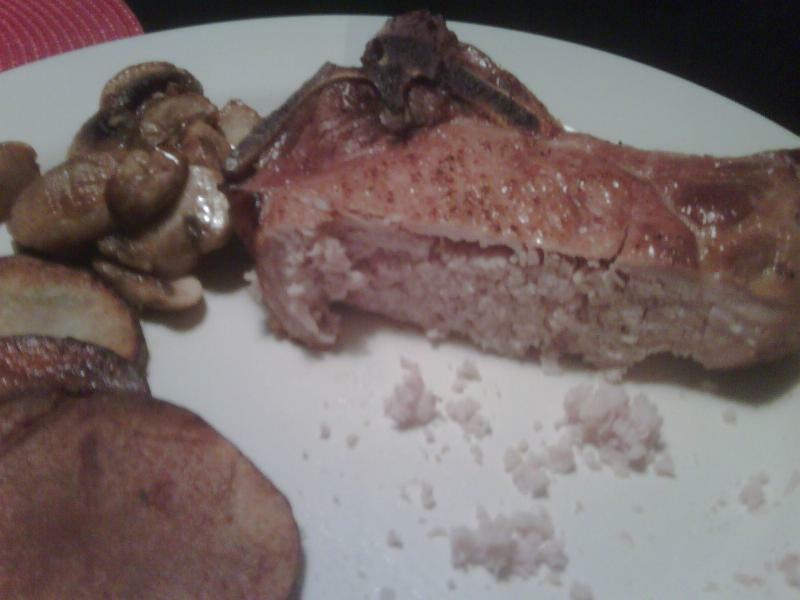 In a pork chop typically the fatty portions are fine, but the lean part feels dry most notably in continued chewing. Juiciness at first bite is the juice in the meat, but in continued chewing, it is the saliva provoked by fat, spices, maillard products, marinade. Over-compression is a problem in fish and to some extent in poultry, but not so much in beef and pork, see http://www.cookingissues.com/2009/06/17/boring-but-useful-technical-post-vacuum-machines-affect-the-texture-of-your-meat/. Clamp type vacuum machines rarely produce a vacuum stronger than 80%, so with these over-compression is not an issue. (See http://sousvide.wikia.com/wiki/Find_out_how_strong_a_vacuum_your_machine_produces ). See my article on thermometer calibration on sous vide wikia: http://sousvide.wikia.com/wiki/Thermometer_calibration . Calibrating against a basal temperature thermometer at 37°C is better than not even thinking of calibration, but nobody garantees your working thermometer or your sensor has a linear temperature response curve that parallels the one of a calibrated high precision thermometer. SousVideMagic 1500A/B have 5k sensors that in my experience are correct at 55°C but show low at lower temperatures and high at higher temperatures. SousVideMagic 1500C/D have 50k sensors that parallel the temperature curve of my ISO-calibrated high-precision thermometer. I saw a couple of posts regarding this upthread, but has anyone else noticed that when you SV beef for 72 hours @ ~132F with no other flavourings, it gets quite an odd smell/taste? Interesting article. Thanks for the link. If I read the graph correctly, at temps above 55C the maximum error is less than 1C and doesn't happen until 90C. The non-linearity seems to mostly be in a temperature range where for proteins a variation of 1C isn't going to make a critical difference. 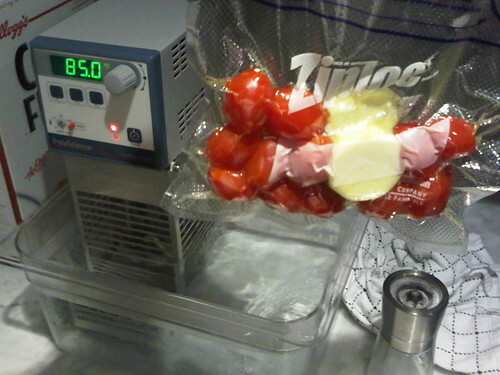 For most applications, there won't be much difference between cooking at 75C vs 76C even after many hours. Did you repeat the trials enough times to find the non-linearity predictable? If so, it would seem that one could have an offset table that should have you pretty close. The easiest temperature for most people to calibrate to is in the range of 36C to 38C since very accurate (+-.2C) thermometers can be purchased for less than $20. The non-linearity seems to mostly be in a temperature range where for proteins a variation of 1C isn't going to make a critical difference. For most applications, there won't be much difference between cooking at 75C vs 76C even after many hours. I absolutely agree. Did you repeat the trials enough times to find the non-linearity predictable? No, this is not something you can simply record with a data logger, I set up my digital camera to take a picture of all the displays at 30sec intervals and then I entered all the data into the spreadsheet. If so, it would seem that one could have an offset table that should have you pretty close. The easiest temperature for most people to calibrate to is in the range of 36C to 38C since very accurate (+-.2C) thermometers can be purchased for less than $20. I should prefer those sous vide geeks who have a NIST or ISO calibrated high precision thermometer to offer a one-point-calibration service (55°C) for other sous vide home cooks living in their region. Or manufacturers of PID-controllers could offer this service for a given controller-sensor-combination at a reasonable cost, then the user can compare his sensor with a basal temperature thermometer at 37°C and recheck this at regular intervals. Frank Hsu of FreshMealsSolutions just told me:"We are now calibrating all our 1500D units/with the sensors before we ship them out to customers. We use the Lada pt100 calibration bath and is accurate to 0.1C and better."